Is Dave using Mike's envelopes, or is Mike using Dave's? Perhaps the limited comprehension of mortal man was never meant to know the answers to some of Nature's most profound questions. Recalling the previous thick-paper shicang [wet storehouse] version of this cake, this is the thin-papered gancang [dry storehouse] version. In the previous tasting, we found mintiness, tobacco, and a very medicinal, cooling character. The shicang leaves were "chopped and bitty". An interesting experience in the comparison between the less-obvious results of different storage methods (upon similar leaves), we found it a fascinating session. 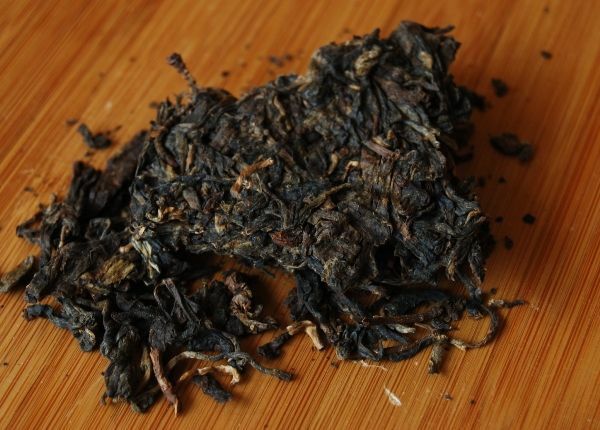 Dark, but more colourful than the shicang: green, yellow, and silver tips, with chocolate-brown additive leaves. Most leaves are, as before, small and fragmented. The deep mushroom aroma has a hint of shicang about it, oddly enough, and a sweet tobacco scent that makes me breath easily. The rinse smells delicious. I settle in for a long session with "The Importance of Living", by Lin Yutang - a long-time favourite of Lei's, and now becoming one of my own. There is nothing new under the sun, so they say, and much of what I believe about the world seems to have been experienced by Lin in equal measure; in his classic book, it is described with that understated charm and intelligence that many generations of readers have loved. His thoughts on enjoying tea with others, and the unsuitability of some types of characters for tea, are perceptive, and something that I would like to discuss another time. The soup is thick and orange. It is fairly tippy to begin with, as its cousin, which begins to subside to normal soup as the infusions wear on. This is a tea with character, it has something to say. 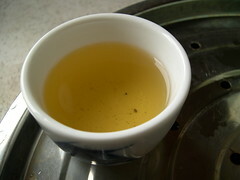 The beidixiang is a rich treacle, with tangible vanilla notes which were hidden in the shicang bing by the damp aroma. It leads into a long lengxiang of sweet darkness. From the aroma, I anticipate rich flavours. The result is unexpected: it is light and high - the same tobacco-and-treacle as the aroma - but also tangy. 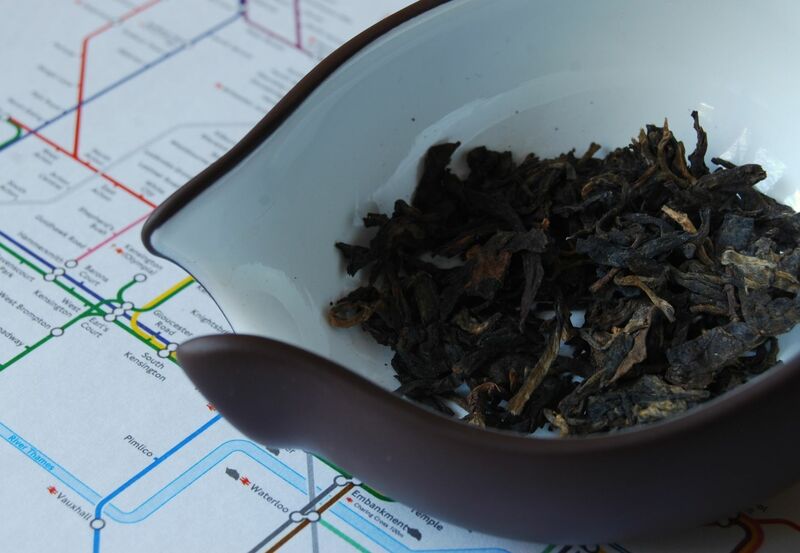 A lively ku runs through the centre of it from lips to throat, promoting a fine huigan. Vibrant, tasty, strong - this tea appeals to me very much. The third infusion takes a turn for the more medicinal, as the inner characteristics of the leaves begin to exert themselves. Again, the cooling sensation comes over me. The hulu [gourd-filter] is piling up with sediment - though the soup is clean, there are many particles thankfully large enough not to make it through to the gongdaobei. Like Lin Yutang, I enjoy the aesthetic, and a soup filled with gunge doesn't really thrill me as much as the pure colour of the soup I see before me today. Drinking tea brings me back to myself. To my breath, to my posture. To the distant tree-tops talking silently with the wind outside the lounge window. It may take an hour or two, but eventually I come back to myself, and the myriad concerns of the day drift away for the duration of the session. Drinking tea has become an integral part of my day, of my person. There is only one instant in this life, and it lasts forever. Hours later, I have returned from collecting Lei from her laboratory, by way of a cafe and an ice-cream shop. She has joined this tea during its closing brews. "Distinctive and penetrating scent; a clean finish". Even after ten infusions, the body is smooth, the character remains robust, and it could continue yet further. What a fine tea. That it seems unavailable after the typically over-generous quantities provide by DL is one of life's little pities, but perhaps that makes its enjoyment all the sweeter. This tea currently sells for approximately $1bn, so I was highly appreciative for a sample from KC. The leaves are as dark and clean as ever. 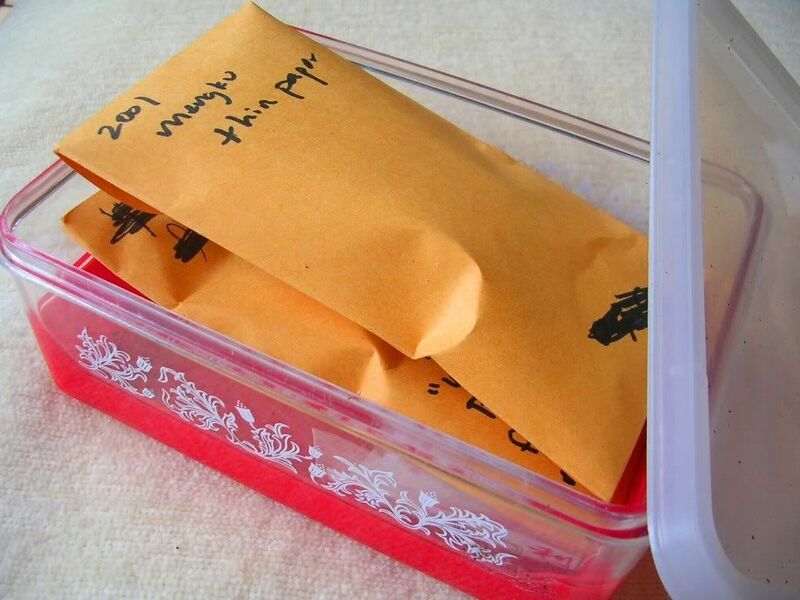 The thick-papered version of this tea currently sells for $30 on Taobao, and I believe that Western vendors made out very well from the craziness that temporarily surrounded this cake for a while, a few years ago. As shown below, the soup turns out to be a clean, wooden orange. The interesting (almost Lincang) flavour of this cake condenses with the kuwei [pleasant bitterness] in the throat to give a cough-lozenge effect, with a tiny trace of sourness. 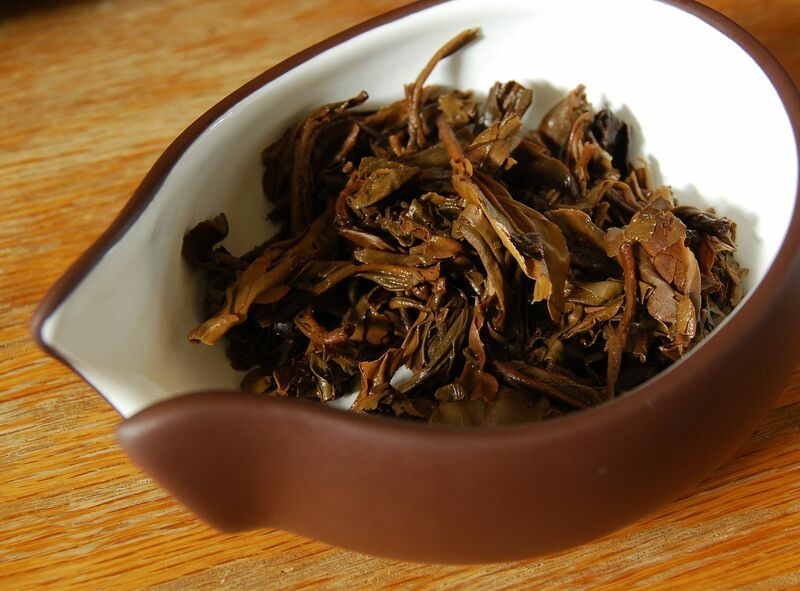 It is an unusual flavour to come across in somewhat-matured pu'er. This tea is as enjoyable as ever, but it is not a masterpiece. 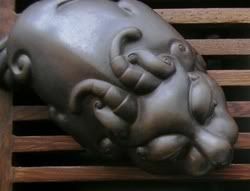 I can see why the shicang [wet-stored] version exists, because it can turn into simple emptiness where one would hope that it would develop into something complex and fine. In fact, at $30, the shicang version is a bit of a steal on Taobao. KJC and I have a few test cakes on order, and we will update you with our progress. "Nothing ventured, nothing gained!" You and I seem to most always have similar reactions to teas. However, you do a much better job of articulating the intangibles. For example: I'm at home drinking a sublime '85 tuocha. My wife asks, "What are you drinking?" My reply, "Some great aged puerh." Her, "What do you like about it?" Me, scratching my head and looking to the cats for inspiration, "ummm... it's... ummm... eh, really... umm... good. You know... uh... good." I have a small sample of this tea awaiting a long empty weekend morning or afternoon. Guang was kind enough to include it with my purchase of a couple of the thick-paper beengs. 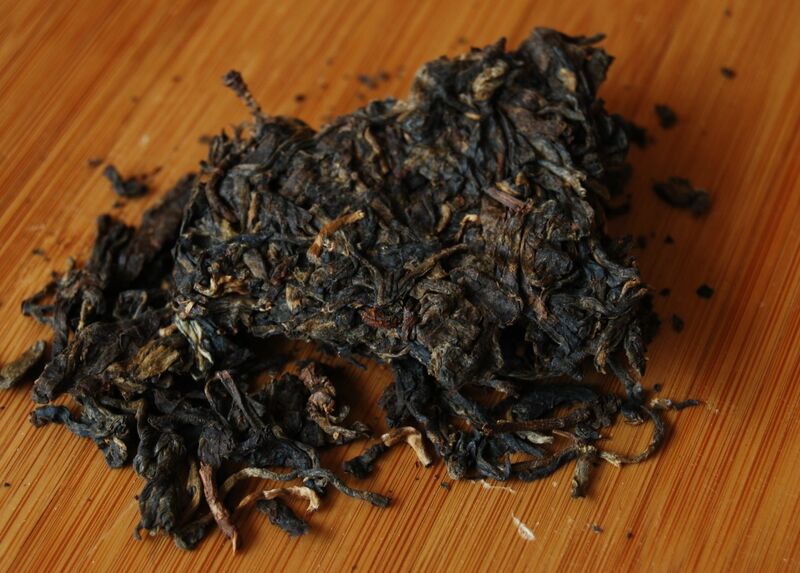 I was thinking of brewing it side-by-side with the thick-paper Yuan Ye Xiang as a lesson in wet/dry storage. Glad to hear it's as amazing as one might expect after tasting its thick-papered cousin, but a pity that it's essentially unobtainable now, at least on the internet. You're writing at 2 a.m., go to sleep! I loved the thick-papered version, but really loved the thin-papered version - how do you get on with the damp character of wet-stored tea? I bought a few cakes of this in China for cheap, and I think they're still quite cheap there, relatively speaking, to be had for maybe 300 RMB. One store in Tianjin sells it, AFAIK. If you want to know where, Hobbes, I can point you to their Taobao store, but a search on Taobao for this cake should reveal it easily. On the other hand, I think while I'm glad I got a few cakes of this, I think a few cakes is more than enough. By auspicious coincidence, Lei and I were discussing whether or not we should attempt to traverse Taobao just for this very cake. I'd really appreciate any guidance that you could provide, and so your offer is greatly appreciated. 300 RMB sounds like a decent price to me (relative to the usual outlets). You're right about the quantity - I'm only after a few. Hmm... was it "Top Aroma" of Tianjin, by any chance? Call me a bit slow, but I've never ventured into Taobao before. I just found the 2004 Changtai Yiwu Zhengshan that we discussed previously for a mere 70 RMB ($10) - approx. one third the Western retail price. There's some interesting cakes on here. not sure whether it's because my first exposure to puer was wet storage sheng, or if maybe i should just move to hong kong, but i quite enjoy (good) wet stored flavor in general, and find the thick-papered '01 mengku very promising. i do agree that the thin-papered version has (at this point in its aging) more variation and subtlety. Wet stored tea can be tasty, yes indeed. Carla, I'm looking forward to reading your notes about the comparison. Ian, we're trying - I'll let you know how it goes; payment from Europe is the difficult part. I've sent you an e-mail with more details. Yes, it's TopAroma. Those guys have some decent teas. I see they've changed the price to 420 now. When I got mine it was 200 a piece. Not from them, I might add. I have also noticed that the "dry stored" thin paper is not entirely dry stored -- many samples have a little bit of whiteness to it. When I saw the thin and thick paper versions samples in Paris, the THIN paper one had obvious moulds on the surface of the tea. As for the YWZP, I think the one you're looking at is the 2005 one. The 2004 is harder to find. Thanks for the comment - much appreciated. 200 is almost criminal. The seller of the cakes claimed they're dry-stored, so let's see - assuming that we can work out a payment strategy. 2001 Shuan Jiang Meng Ku Factory "Yuan Yieh Xian"
Can I smell the wet storage right off the dry leaves? I think I can; it is a spicy, sharp tanic note; the bottom of the leaf-pile. No mold nor mustiness, but a definite impression of dampness (by association) is conveyed by this smell, which is absent in the GanCang. The liquor is uniformly darker, too, than the thin-paper, both beautiful, clear shades of reddish amber. This earthy smell predominates in the aroma as well, obscuring a subtler, plummey fruit note which comes across in the dry stored tea, and which I would like to explore further. A subtle, wafting, darkish plum-like fruitiness floats above a base of forest floor. I'd like to know what this would do in the wenxiangbei, but I left those at work. Darn. A slow-developing smooth mouthcoat competes with the sharper spicy sensations of leaf tanin. The aroma is markedly more earthy, with an underlying sweetness that is less articulated than the fruit of the GanCang, yet surely present. The greeting is actually smoother and more glycerin-like than the GanCang, which does not present as smooth, but develops into smoothness. The spicyness is more focused in the taste, rather the sensation and, as such, is acually less "rough" than the GanCang. What can be said of the qi? D.C. described both teas as "cooling"; what I am experiencing is a gentle relaxation, a cooling of temperament more than temperature. 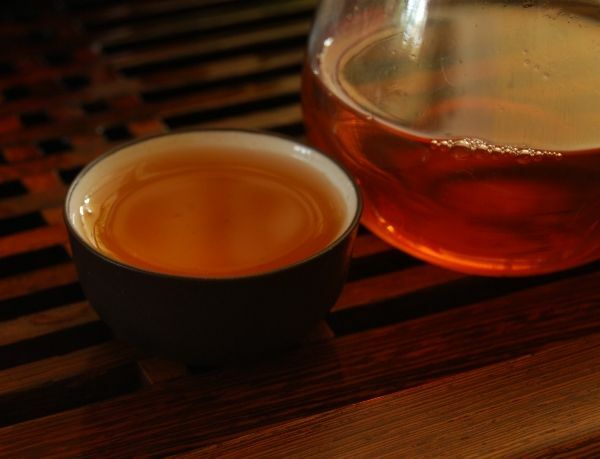 Both teas offer similar levels of ku, and a slowly developing huigan, although alternating infusions, as I am doing, I could be experiencing the latent effects of one or the other, although the impression is that they are very similar in this regard. The sensation in the throat is deep, feels like it reaches down to my sternum; relaxing and pleasurable. Both of these teas are excellent, and I cannot conclude with a preference for one or the other. Great notes, Carla - thank you for posting them. Drinking them interleaved-serially sounds as if you'd get a good basis for comparison throughout the progress of the infusions, a good idea. 2007 Dianhong "Yongji Hongya", "Hongyawang"
2005 Menghai Dayi "Jinzhen Bailian"